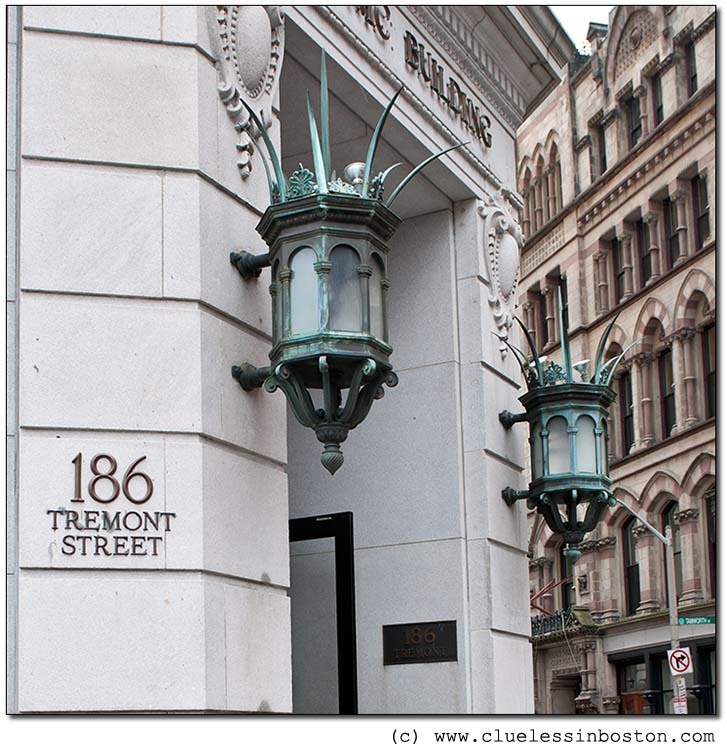 Iron lanterns on the Masonic Building on the corner of Tremont and Boylston Streets. Sorry, but those are copper. Iron turns brown as it oxidizes... copper turns green. Nice shot, even if you are a little fuzzy on your metals. Cool lanterns! They look like ones for a castle! Gorgeous! Love these details of Boston. To hell with the critics! I love the shot! One wouldn't want to fall out a window and land on the top of those lanterns. Well, I wouldn't! Beautiful architectural details on buildings and lanterns. Not that it matters but they are more likely bronze than pure copper. They are unusual. Maybe that crown like design has some secret masonic significance. That doesn't matter either. They are very handsome.